Now in its 26th record-breaking year, this multi-award winning musical continues to captivate audiences at Her Majesty's Theatre in London's West End, after more than 10,000 performances. This production currently takes bookings until October 2016. The award-winning musical tells the story of the mysterious Phantom who lives underneath the Paris Opera House in a subterranean world, after he escaped from a travelling freak-show. He falls in love with the new debutante Christine, who in turn is in love with the patron Raoul - jealousy ensues and the Phantom vows to take revenge on Raoul. 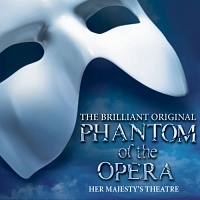 There are many familiar songs throughout the show, including the title track, "All I Ask of You" and "Music of the Night", all of which were made famous in the 80s by previous performers such as Michael Crawford and Sarah Brightman. Click on the Book This Offer button for more details and to check for availability.